This Scalloped Corn Casserole makes a great side dish. This scalloped corn casserole is so good and the bacon flavor really adds to the recipe. A great side dish for any meal. Fry bacon, drain and set aside. Cook onion and green pepper in 3 tablespoons of the bacon drippings then add cracker crumbs to the skillet with the green pepper and onions and brown just a little. Set this aside. Combine corn, eggs, pimentos, milk, salt and pepper (mixing with a spoon) and pour into sprayed 2 quart casserole dish. Sprinkle green peppers, onion and cracker crumbs over the top. Next, sprinkle on the cheese and crumble the bacon slices on the cheese. Bake in preheated 350 degree oven for 45 to 50 minutes. Makes 8 to 10 servings. Enjoy! Don’t forget to pin Scalloped Corn Casserole. This recipe for Scalloped Corn Casserole is one you'll make over and over. Fry bacon, drain and set aside. Cook onion and green pepper in 3 tablespoons of the bacon drippings then add cracker crumbs to the skillet with the green pepper and onions and brown just a little. Set this aside. Combine corn, eggs, pimentos, milk, salt and pepper (mixing with a spoon) and pour into sprayed 2 quart casserole dish. Sprinkle green peppers, onion and cracker crumbs over the top. Next, sprinkle on the cheese and crumble the bacon slices on the cheese. Bake in preheated 350 degree oven for 45 to 50 minutes. Do you think you could make this 24 hours ahead of time and let sit in the fridge then bake it the next day? I have not tried making it ahead of time, Danielle, but if I did I think I would wait until right before cooking to sprinkle on the cracker crumb mixture. Sorry, Evelyn, I don’t have this one. Stewed tomatoes with bread simply combine canned tomatoes crushed with half stick butter half cup sugar salt n pepper to taste approx. Four slices bread cued combine all ingredients bake 30 to 45 minutes enjoy..
Loving on this, don’t know if it’s what Evelyn was looking for Earl, but I’m liking it! I love your recipes. My last 2 Thanksgiving dinners have been a huge success thanks to your recipes. I have never had a corn casserole. Looks so good will have to give it a try. Yes Please! I love corn casseroles…and with bacon? Perfect! Yes Please! 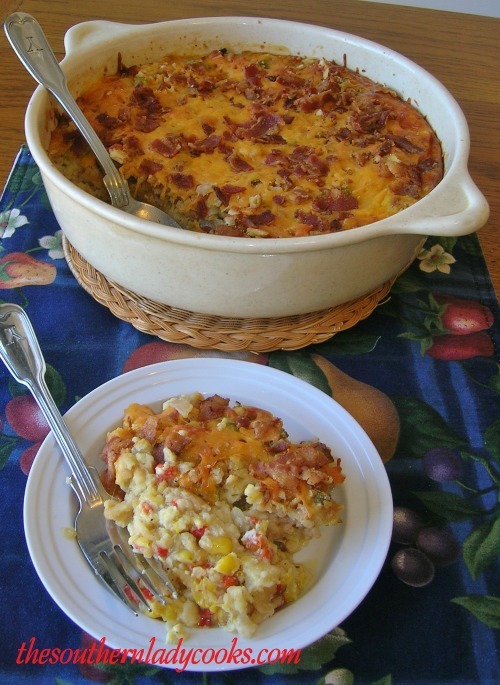 I love corn casseroles…and with added bacon? Perfection! Thanks so much for sharing. I’m going to make this for dinner tonight…I’ll let you know how it turns out It looks great i have everything that this calls for I just love your site Keep the recipe coming……WANDA.